I’m a bit tardy getting to In My Kitchen this month. Until the Saturday just past my head and time had been filled with attending to last minute paperwork for our Life Drawing Group’s Open Studio exhibition. The exhibition is now open to the public so now I can direct my energies elsewhere. 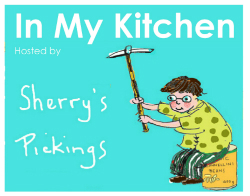 I’m linking this In My Kitchen post to the worldwide forum of food blogs hosted by Sherry @ Sherry’s Pickings. It’s an amazing group, there is always something to learn so click the link at the bottom of the page and check it out. Better still why not join in. Although it’s been fairly quiet In My Kitchen I’ve welcomed the cooler weather to Brisbane with open arms, soup, slow braised meat and red wine. 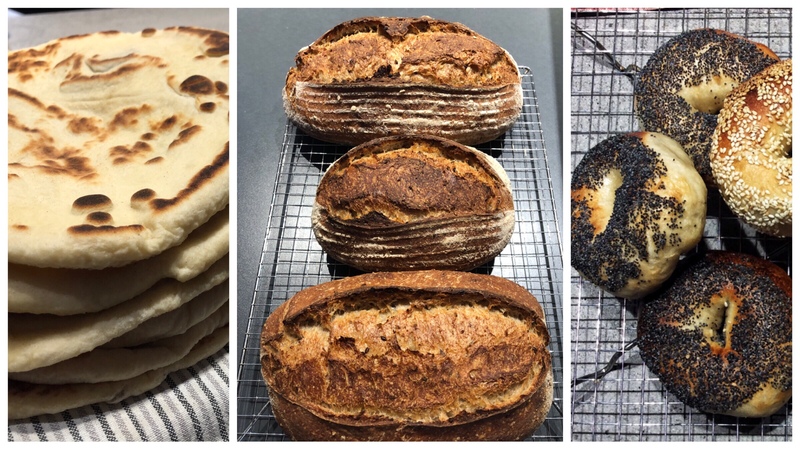 All require sourdough bread to make them complete so every week I bake bread; 3 X seeded spelt loaves and either a batch of bagels or flatbreads. I share the freshly baked bread with neighbours if there is a backlog of loaves in the freezer but I won’t stop baking, I find the whole process super satisfying. It’s taken some adjustment moving to a sub tropical climate. Recently my pantry has been inundated with moths. It’s annoying, frustrating and wasteful. I already store all my ingredients in sealed containers but I’ve begun leaving grains and flours in their original packaging as well to try and isolate the source of the bugs. Expensive rices which I only use in small quantities I’ve put in the freezer. Meanwhile I have bay leaves in the pantry to deter the pests and a Pantry Moth Trap which cynical ol’ me admits actually works. Does anyone have further advice? It’s citrus time here in Brisbane. Unwaxed and odd sized oranges, lemons, limes, cumquats, mandarins and grapefruit, fresh from the tree are plentiful at the market. A mandarin is the perfect snack, fresh, portable and easy to peel, so simple even my young grandson can manage alone. It was a happy day when I discovered this old recipe book tucked inside another stouter publication last week. After a fruitless search a few months back I had deemed it lost. It seems our thoughtful relocation packer had recognised it’s fragility and protected it from damage. Published C1967 while I was a still a school, this wonderful little book is a snapshot in time of the locality in which I grew up, food products and home cooking in suburban Melbourne. My Mum has several recipes included. Waste and recycling is a big issue in our lives so I felt compelled to share this non kitchen item. I received a fragile package through the mail recently. It was padded with a single flat sheet of brown paper that had been miraculously transformed into 3D cushioning by simple and ingenious design. The entire sheet was perforated by short slits. They had been made in parallel lines and every second line was offset alongside it’s neighbour. When you pulled the paper to open the slits, the pressure twisted the paper into a sheets of tiny 3D windows. Plastic bubble wrap be gone! I do love all your baked goods. Glad you relocated your ca. 1967 cookbook. Those old cookbooks really are an insight to a time and place that you don’t often get in conventional history books. I recently read in a 1909 cookbook on hanging up ropes of cloves to deter flies – might also help with those moths. What a great looking recipe!! Thanks for sharing; we love anything that has to do with citrus! And the pics of the old recipe booklet….priceless! That citrus looks amazing. We battle moths too (since The Hubs left some brewing grain in the pantry). No advice other than a total clean out an insecticide and some sporadic swatting. So glad you found that special recipe book and that eco friendly packaging is the biz! And what a small world it is, reading all the above comments! It’s crazy how small this world is, all revealed by my old recipe book, Cheers Cheery.. I use the same gadget for catching moths, and I have for years. I have them in closets, as well. They’re reliable! Sandra, discovering an old cookbook… how wonderful and the memories that come with it. I know what you mean about annoying bugs we have the same issue here and store many items in the fridge. Waste and recycling is a huge problem something that we cannot ignore. This is like a flashback to a Northern suburbs reunion Sandra- I travelled past your High School every day on the way to St Comumbas in Essendon. I grew up in Pascoe Vale, just over the ridge of that huge hill. And then when you were over in Panch, I was probably still at Latrobe. I know that Maree grew up in Preston. She refuses to go back there, even though I keep telling her how wonderful the Preston market has become, not to mention all the Vietnamese grocers that line High St and the Indian lunches for a song. So we all could have crossed paths in a previous life though I am sure I’m a bit older than you and Maree, I still visit Pascoe Vale as my mother lives at home at 95. Mr T and I moved into our own little shabby house in Essendon in 1969 when our first son was born. Now just look what your old recipe book stirred up. Unbelievable! I remember when Preston Mkt opened, everything seemed so exotic but that’s where I shopped when I began keeping house. Mal like Maree was always a bit reluctant to go back, too many raw memories of a tough life I think. Crazy all this familiarity but I guess Melb was a bit like a large country town back then. My Gparents settled in Essendon when they came from England in 1929 and stayed there the remainder of their lives. Ah Ancestry. I lost a whole winter there, but it’s amazing what you can find out and I glad I put in the effort. Glad you went back and disposed of those useless demons, Maree. The parking at Preston market very much depends on the day of the week. I like Wed morning. There’s a new fish shop there, Nicks, his fish is to die for. One of the little shops in the refurbished side sells big backs or organic wholemeal Lauke flour, the Indian guy next door is also good for odds and ends, and the middle eastern man for nuts. And for lunch, the Paella Spanish shop is wonderful. The girl who runs that used to have a stall at our local market in St Andrews but is now a permanent at Preston. Yell out if you ever decide to revisit and we can catch up there. Enjoyed your kitchen (and other) bits and pieces here, Sandra. When we lived in Darwin I had to keep so many things in the fridge and freezer for reasons you have just described. And yes, I found bay leaves did work there too! We are waiting for last week’s frosts to perform their magic on our lemons so they will turn juicy and sweet. Enjoy your cooler weather! That’s a brilliant idea Kate. How annoying re the bugs! I breathe a sigh of relief every time a check and so far (touch wood) I have been spared. Beautiful looking breads and yes, it’s wonderful baking now its a bit cooler. Strathmore eh? I grew up in Preston, a much seedier place than Strathmore, I couldn’t leave there quick enough. I adore those old cook books and love the fact that many of the recipes are still firm favourites for all ages. I have quite a selection gathered from god knows where 🙂 Patiently awaiting our mandarins to be ripe enough for picking, the little fella is getting quite impatient! Haha! My husband is a Preston boy and I did my nurses training at PANCH when it was in Bell St, so Preston is writ large in my life too. It’s such a small world! OMG! My sister was in the first intake of nurses at PANCH. We lived in Ruby St off Bell St down the dodgy end. Yes she is about 73, there is a 12 year gap and I should never have been born. Was never allowed to forget that either! Imagine the convos around the table if yourself Francesca and I got together What a hoot! Which Primary School did your husband go to? I went to Preston Girls’ High so wouldn’t have crossed has there. He went to Reservoir West Primary then Preston Tech..
Ahhh, I wanted to go to the tech but dad put his foot down. Preston Girls was reputedly a great school in it’s day, so your Dad was probably in the know. They are rebuilding another school on that site ( was it another Kennett forced removal?). The area has turned super trendy and you can’t buy much for under $900,000. You, like me, couldn’t leave those suburbs quick enough but I’m wondering when you can breathe in deeply and return with me for a market trawl. Your bagels look perfect! You are lucky to be near such varied citrus orchards, even if the climate brings you pantry moths as well as mandarin oranges. I love your beautiful kitchen post. This entry was posted on June 7, 2018 by ladyredspecs in Cooking, Food, In My Kitchen and tagged IMK, in my kitchen.